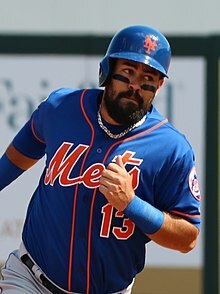 Luis Miguel Guillorme Gonzalez (born September 27, 1994), nicknamed "Luismi", is a Venezuelan professional baseball shortstop for the New York Mets of Major League Baseball (MLB). Guillorme was born in Caracas, Venezuela. His grandparents immigrated from Spain and he held dual Spanish and Venezuelan citizenship. As a child, he modeled his game after native Caracas infielder Omar Vizquel. In 2007, his family relocated to Davie, Florida. Guillorme attended Coral Springs Charter School in Coral Springs, Florida where, as a senior, he hit .565 with 34 runs batted in. He committed to play college baseball at State College of Florida, Manatee–Sarasota. The New York Mets selected Guillorme in the 10th round of the 2013 Major League Baseball draft. He spent his first professional season with the Gulf Coast Mets where he slashed .258/.337/.283 with 11 RBIs in 41 games. He played 2014 with the Kingsport Mets and Savannah Sand Gnats, batting a combined .283 with 17 RBIs in sixty total games between both teams. He returned to Savannah in 2015 and was named the South Atlantic League MVP after he batted .381 with 55 RBIs, 18 stolen bases and a .746 OPS in 122 games. In 2016, Guillorme started at shortstop for the Spanish national baseball team in the qualifying for the 2017 World Baseball Classic. He spent 2016 with the St. Lucie Mets where he posted a .263 batting average with one home run and 46 RBIs, and 2017 with the Binghamton Rumble Ponies where he batted .283 with one home run, 43 RBIs and a .706 OPS. The Mets added Guillorme to their 40-man roster after the 2017 season. Guillorme was called up to the Mets on May 9, 2018 when Tomas Nido was optioned to the Las Vegas 51s. On May 13 at Citizens Bank Park, Guillorme made his first Major League plate appearance; he singled off of Aaron Nola of the Philadelphia Phillies as a pinch hitter. ^ "2018 Players' Weekend nicknames". MLB.com. August 25, 2018. Retrieved February 10, 2019. ^ a b Healey, Tim (March 21, 2018). "Carjacking scare shaped Mets prospect Guillorme". Newsday. Retrieved May 14, 2018. ^ a b Rubin, Adam (April 13, 2016). "Farm Report: St. Lucie gets second helping from SAL MVP Luis Guillorme". ESPN.com. ESPN. Retrieved May 14, 2018. ^ Cabrera Chirinos, Christy (June 3, 2013). "All-County baseball Class 5A-4A-3A-2A". Sun-Sentinel. Retrieved May 14, 2018. ^ "SCF Baseball well represented in MLB Draft". State College of Florida, Manatee-Sarasota. June 10, 2013. Retrieved May 14, 2018. ^ Wagner, James (March 3, 2017). "Catch of the Year. No Ball Involved". Retrieved June 2, 2017 – via NYTimes.com. ^ "Sand Gnats' Guillorme is South Atlantic League Most Valuable Player". savannahnow.com. Retrieved June 2, 2017. ^ "Farm Report: Luis Guillorme 'a gifted defender at shortstop'". espn.com. Retrieved June 2, 2017. ^ "Heavy on shortstops, St. Lucie Mets open 2016 season Thursday at home". tcpalm.com. Retrieved June 2, 2017. ^ "Luis Guillorme Stats, Highlights, Bio - MiLB.com Stats - The Official Site of Minor League Baseball". MiLB.com. Retrieved February 20, 2018. ^ Mastracco, Abbey (November 20, 2017). "Mets add prospects to 40-man roster | Who did they protect from the Rule 5 Draft?". NJ.com. Retrieved May 14, 2018. ^ Carducci, Brendan (May 9, 2018). "Luis Guillorme called up, Tomas Nido sent down". Amazin' Avenue. SB Nation. Retrieved May 14, 2018. ^ Cranston, Mike (May 13, 2018). "Mets' Jacob deGrom Lasts 1 Inning In Loss To Phillies". Hartford Courant. Retrieved May 14, 2018.